Democratic Rep. John Conyers' (Mich.) hometown newspaper, the Detroit Free Press, called on him to resign on Tuesday night following allegations that he sexually harassed female staffers and reports that he quietly settled one such complaint with a former employee using taxpayer money. "U.S Rep. John Conyers must resign," wrote the paper's editorial board, adding that the longest-serving member of the House "must go" after a "public betrayal." BuzzFeed News first reported on Monday that Conyers, 88, paid a former female staffer over $27,000 from his taxpayer allocated discretionary fund in 2015 to settle her complaint, which also required her to sign a confidentiality agreement. 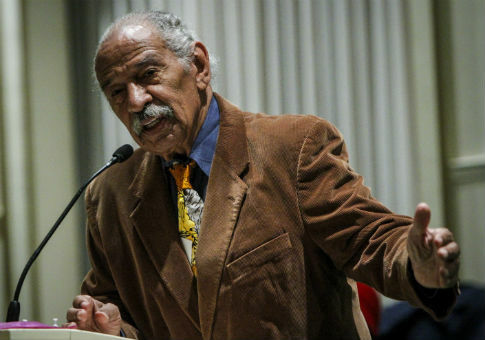 The report included multiple published affidavits of former staff members who said they witnessed Conyers touching female staffers in an inappropriate manner. Conyers confirmed the settlement in a statement, saying it was meant "to save all involved from the rigors of protracted litigation," but denied the sexual harassment allegations. Then on Tuesday, BuzzFeed reported that one of Conyers' former schedulers came forward after the original story to say that she experienced similar sexual advances from Conyers that included "rubbing on her shoulders, kissing her forehead, covering and attempting to hold her hand." In its editorial, the Detroit Free Press first praised Conyers, calling him an "undisputed hero of the civil rights movement," and touched on his power and influence before examining his sexual harassment scandal. "He has been an undisputed hero of the civil rights movement, a legislator of uncommon influence and power, and an aging icon whose felonious wife and sometimes-wandering pace have confounded his place in history," the editorial read. One sentence later, the editorial board skewered Conyers' alleged behavior and said that his actions to bury the scandal were "in violation of congressional ethics rules." It is the kind of behavior that can never be tolerated in a public official, much less an elected representative of the people. And it means that whatever Conyers' legacy will eventually be, his tenure as a member of Congress must end—now. He should resign his position and allow the investigation into his behavior to unfold without the threat that it would render him, and the people he now represents, effectively voiceless. "John Conyers Jr. must go—after 53 years in Congress, after a stellar career of fighting for equality, after contributing so much to southeast Michigan and the nation," the editorial board concluded. "It's a tragic end to his public career. But it's the appropriate consequence for the stunning subterfuge his office has indulged here, and a needed warning to other members of Congress that this can never be tolerated." This entry was posted in Politics and tagged Detroit, House Democrats, Michigan, Sexual Harassment. Bookmark the permalink.